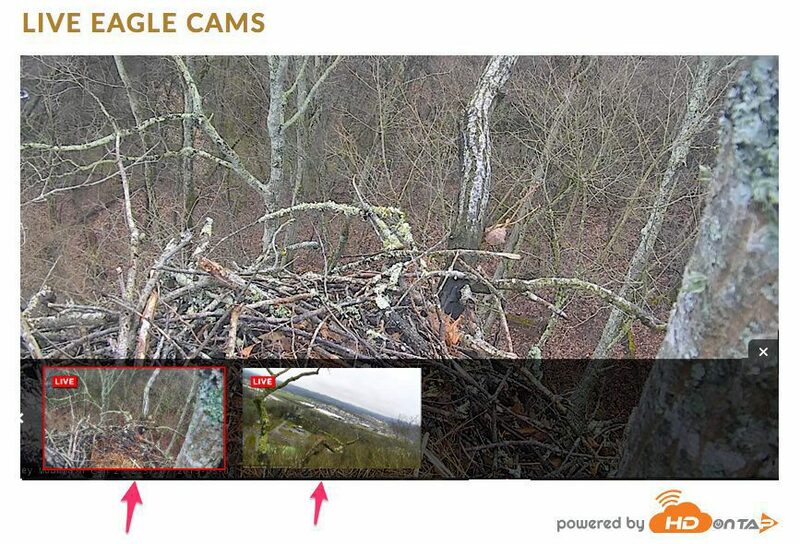 The AEF has placed 2 HD video cams on the nest tree in order to provide different perspectives of the nesting season of Lady Independence and Sir Hatcher II. 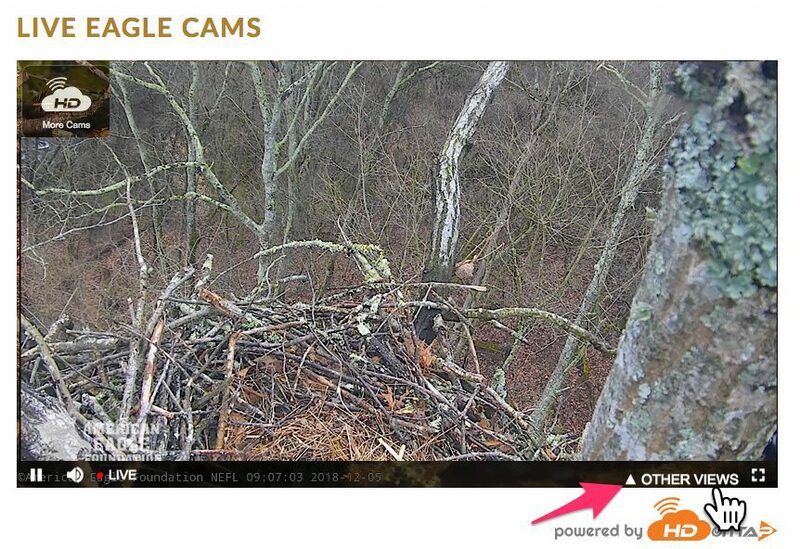 Our new streaming partner, HDOnTap, provides thumbnails for “Other Views” — so, if you mouse over the cam, you will see two views at the bottom of the screen. By default, Cam 1, or the first thumbnail, is streaming. If you want to see Cam 2, click on the 2nd thumbnail. In the images below, note the “Other Views” at the lower right. You will see that if you mouse over the video screen. When you click “Other Views,” 2 thumbnails appear and you can select the one you want to see! To close the thumbnail view, click the “x” above the thumbnail strip. Our streaming partner, HDOnTap, has some troubleshooting solutions that may be helpful if you ever encounter any of the following issues. Buffering can occur for a number of reasons when viewing a live stream. While it is possible that buffering can occur due to the network at the camera site or the streaming provider’s network, the majority of buffering cases are the result of the viewer’s network, connectivity, or device. Clear your browser’s cache and cookies. Tip: Click here for more information. Make sure you are using the most current version of your browser. Try using a different browser such as Chrome or Firefox. Try using a different device. Try a wired connection if you are on a wireless connection. Many of our viewers like to keep tabs on multiple cams, however attempting to stream multiple cameras at once (or engage in other bandwidth-heavy activity like YouTube, Netflix, music streaing or downloading) may result in buffering. If there are multiple people or devices using your network (IE: connected to your home or office WiFI), the collective usage will impact the bandwidth available. Check to see if others are engaging in bandwidth-heavy activity like streaming or dowloading. In some cases, TV usage may impact your available bandwidth. For example, AT&T Uverse television may share available bandwidth with Uverse internet, meaning that watching TV (especially in high definition) may cause buffering. Contact your TV/ISP if you believe this may be occurring. TIP: Force refresh by pressing Ctrl + Shift + R (PC) or Command + Shift + R (Mac). Occasionally, viewers notice and report issues before our team does. We appreciate these “heads up” notices. If you believe we may not be aware of a live stream issue, please feel free to contact us at support@hdontap.com. 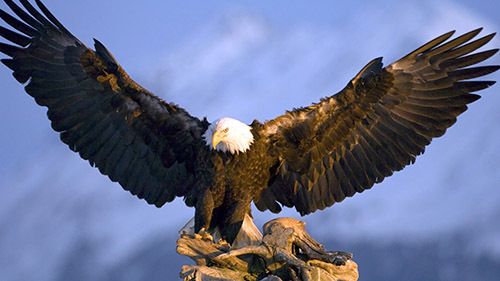 Help save and protect our nation’s majestic eagles.